The first successful American newspaper was founded in 1704 by a postmaster named John Campbell. Called the Boston News-Letter, it was not unlike many email newsletters today: Campbell wrote “a summary of the most noteworthy items of information that passed through his post office and circulat[ed] that newsletter to a small group of friends.” As journalism historian Christopher Daly writes in his book Covering America, Campbell “filled his paper with stories that he lifted from London newspapers – supplemented by letters from his friends, news of the comings and goings of ships, public announcements, and some paid advertising.” Campbell didn’t have access to Substack or TinyLetter, but his product – a prototype for American newspapers – should sound familiar to subscribers of modern email newsletters. As media companies and the public have grown more skeptical of social media platforms over the past few years, email newsletters have seen a resurgence. Publishing companies are being built around them, new publishing tools are gaining momentum, and we’re seeing countless experiments in editorial style, format, and more. But for all that experimentation, much of publishers’ effort around email newsletters has focused on what’s new. That makes sense, given that reporting the news is journalism’s central charge, but it’s only one opportunity that email provides. At Harvard Business Review, we recently launched a newsletter designed around more evergreen content. We wanted to blend the focused, short-run, “finishable” nature of pop-up newsletters with a more educational, course-like approach. We were inspired by how online learning platforms convey a sense of progression and by The Economist’s Espresso app, which offers the feeling of having completed the day’s news. The result is our 8-week email series on Managing Data Science. 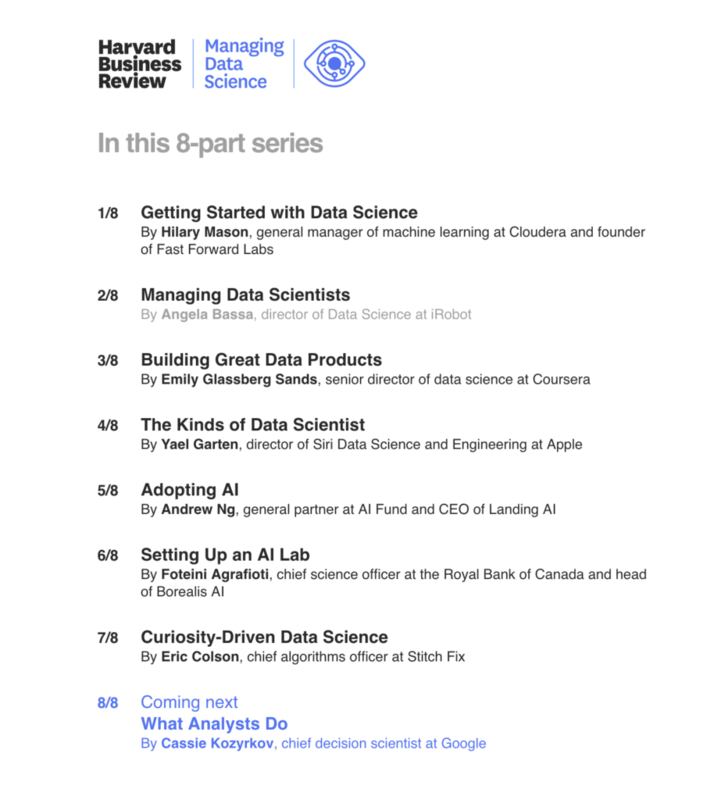 When we started thinking about this project in early 2018, there were already lots of excellent newsletters devoted to data science and machine learning. Many of these, though, focused on technical, business, and societal perspectives. We wanted to cover the challenges that organizations face in actually managing data science work and teams. HBR was inspired by how online learning platforms convey a sense of progression and by The Economist’s Espresso app, which offers the feeling of having completed the day’s news. The result was an 8-week email series on Managing Data Science. Based on the success we’ve had with other curated products like our Must Read book series, we hypothesized that readers would prefer a finite series of carefully selected content over an ongoing weekly or monthly newsletter. We interviewed numerous data scientists to better understand the biggest management challenges that they were facing on their teams and to get their feedback on the concept. Then we commissioned and edited eight digital articles that became the heart of our email series. The articles were written by professional data scientists who’ve worked at companies including Google, Apple, Netflix, Stitch Fix, and Coursera. Each email in the series focuses on one theme (like the different types of data scientist), with all eight amounting to something of a mini-course on managing data science. Following on the newsletter success that publishers including Axios and DealBook have had, we designed our email series to be more than a collection of links to content. Each issue links to one of the eight articles, but also contains what we think of as a “mega-summary” – a 400-word version that basically gives you the gist. It also includes further relevant reading from HBR and other sources, as well as a more lighthearted stat or chart at the bottom to reward readers who make it all the way through. So far, Managing Data Science has been a success. More than 38,000 people have signed up for the email series, and our open rate is over 40%. We expect the audience to grow substantially throughout 2019. In our experience, the evergreen-series approach to email has significant advantages in terms of product development, user acquisition, and editorial resourcing. Unlike an event-based pop-up newsletter, we didn’t face pressure to drive signups immediately at launch. We were able to stagger promotion over several months, testing and gathering feedback. This ultimately allowed us to make improvements to the design of the newsletter before promoting it to a larger audience. We’re now able to continue promoting the series and driving engagement with our readers without endlessly creating new content. Instead, we can focus on incrementally improving the series for new subscribers. We’re not the only ones experimenting with evergreen content in newsletters. The New York Times has given its Smarter Living material regular space in its morning news briefing. Even closer to our experiment, The Information is offering email courses on topics like the future of mobility; Vox.com launched a newsletter on giving to charity at the end of 2018 that followed a similar approach; The Washington Post has a 12-week email series on cooking; and the Pew Research Center recently launched a two-week email course on immigration. These examples as well as our experience suggest that evergreen newsletters can become a critical part of publishers’ strategies. For one thing, email engagement tends to decline over time; short-run newsletters don’t ask readers to sign up in perpetuity. Therefore, they tend to have higher engagement. They also help publishers focus on a particular audience. And that focused relationship is between the publisher and the user, not mediated by social media algorithms. Finally, as mentioned, evergreen newsletters are a chance to take an iterative approach to improving email products. Because the content doesn’t need to be refreshed every day or week, more attention can be spent to continually improving other elements of the experience – such as the subject line – and adjusting where users would most benefit. Newsletters are only going to become more important for publishers in the coming years. They can take many forms, and news briefings likely will (and should) be the quintessential email product. But email programs don’t always need to emphasize what’s new. They can help users learn about new topics or acquire new skills, too. Nicole Torres is a senior associate editor at Harvard Business Review. 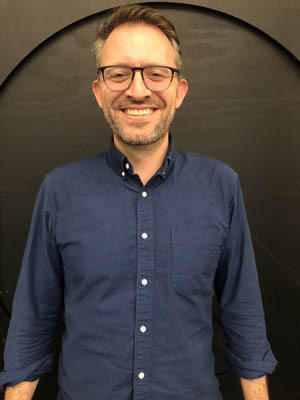 Walter Frick is the deputy editor of HBR.org and will be speaking at DCN Content Everywhere on April 25. With so many new and immersive ways to reach audiences on their mobile devices, it’s natural to wonder if email, now nearly 50 years old, has lost its luster. But before you make a call consider reams of research that show email rules as the most reliable way to reach consumers everywhere on the planet. Granted, email took a hit in the wake of the European Union’s May 25 General Data Protection Regulation (GDPR), legislation that raised opt-in standards for email campaigns. However, the cleanse that followed also produced audiences that are genuinely interested in receiving communications and content from companies that have their express consent. It raises the question: Can companies do more with email newsletters to drive deeper engagement with their content? The answer is a resounding “yes.” That is if they move beyond offering collections of links to offering content that has a distinct voice, format and style all its own. This is the strategy championed by Quartz, a six-year-old mobile-first publisher widely credited with helping reinvent the email newsletter. The company, which was recently acquired from Atlantic Media by Uzabase, a Japanese business intelligence and media company, broke new ground in 2017 with the launch of Quartz Obsession. The edgy email deep dives into topics that have “seismic importance to the global economy” and reports an open rate of 78%, much higher than the industry average of 22%. PAS: Katie Weber, VP of client partnerships for Quartz, is quoted as calling the inbox “the new homepage for executives.” How do you choose and craft newsletter content that will consistently appeal to this high-value audience? AP: I think we’ve certainly struck a chord with an audience that is more than the sum of the numbers. We have bespoke editorial and news coverage that we tailor for our products including the Quartz Daily Brief, Quartz Obsession, as well as the Quartz app for iOS and Android. Each has their own content and their own voice. Sometimes we adapt articles from the main Quartz site, but most of the time we are writing the content from scratch. It’s the best way to treat each of those products as their own thing, with their own audience, their own appeal and their own writing staff to make the package complete. Quartz Obsession is a great example of this. We looked at just piping regular Quartz content into these products, but we found it to be an unfulfilling experience. It just fell flat. PAS: I’m hearing that your audience is a demographic that values an element of serendipity and rejects content that feels stale. How do you keep your content fresh? AP: We are constantly testing and rolling out new products, and the Quartz Obsession email is a great example. It’s had a hugely positive response out of the gate because it invites readers to go down a rabbit hole every day on one very kind of narrow topic. Then it opens your world by giving you a big-picture view of the topic in the context of the wider world. PAS: You call it the daily “digression.” But is the starting point the daily news? AP: The content is inspired by topics that are in the news. But we go a step further delivering more evergreen content that sheds light on the weird and wild tangents. In this way we fill a need that people have to be delighted and surprised with content that touches on the issues of the day but also takes some unexpected turns to inspire them to see and experience what is beyond the news. Across all Quartz stories and products there’s kind of a common editorial DNA that should run through them. But we don’t only use Quartz stories as a starting point. We are agnostic in terms of where our stories start off. It can start with a Quartz story, we are also happy to use stories from other sources for the app and the emails. It’s not about driving traffic back to the Quartz mothership; it’s about finding the best stories for our audience no matter where they started off or where they may have originated. PAS: You oversee several products, including apps and chatbots. What are the content offers and audience preferences across these platforms? AP: Each of those products has its own advertising format, one that is appropriate and native to that platform. This ensures that we are not reliant on driving people back to Quartz.com. This is why we feature stories from other news outlet and then adapt it and tell it in our own way. Across all these formats it’s about channeling the news into a more casual conversational style, while keeping it very tight and concise. The tone that we are aiming for is one that is how you would write if you were describing the story to your friends. The chatbot on Facebook Messenger presents content in a conversational format, so we use different tools to kind of mimic having a conversation with a real person. There are real people writing the responses, but it takes place in an automated algorithmic fashion. The starting point is often a push notification. Then the experience can go beyond what’s happening in the world to sharing ways you can enhance your world. For example, we’ve taken people through lifestyle ideas and inspiration like how to bake your own soda bread. We’ve experimented with different experiences and see audiences spend the most time on content around the news. But for chatbots, as well as apps, it’s also important to mix serious stories and with topics that are off-beat or lighthearted. You want to have a diverse story mix that doesn’t kind of beat people over the head with one kind of story. It should feel more eclectic. Our app is available on the watch, so we know we touch reader’s lives in ways that are immediate. It’s about developing innovative ways to be valuable and offer value throughout the day and across platforms. So, you start the morning reaching for your smartphone and you scan the news on what happened while you were sleeping. The Daily Brief provides a kind of editorial intelligence service and it has a very loyal audience. With the app, that’s where readers dip in and out to learn something or be delighted with content and then get on with your day. Obsession comes in when your day is wrapping up, when you’re a little exhausted and you just need something to kind of take you out of your world and into an unexpected direction. PAS: You provide me the news and experiences you think I want. Why don’t you ask me? AP: We are assuming that if you found your way to us you that you also like the Quartz editorial. That’s why we purposely pick, curate, and write stories that fit in with our kind of Quartziness. And that’s our goal. It’s not about the capability to write something different for every individual person. It’s about having a purpose and approach to telling the story that resonates with our audience. In a time when the email channel is becoming increasingly clogged, you would think email newsletters would take a back seat to other forms of audience interaction. But just the opposite seems to be happening as media outlets see the newsletter as a way to communicate directly with their core audiences. Email newsletters are popular and proliferating. Perhaps this trend is being driven by the success of newsletters like The Daily Skimm, an email-only news briefing delivered every morning with a colloquial tone that treats the news with a sense of humor and gives you what you need to know in an entertaining fashion. Regardless, every major media outlet seems to offer a variety of newsletters. These are often segmented into subjects like finance, politics and sports, full of links and information, and designed to provide the core audience with details tuned specifically for them. Newsletters remain popular because they deliver value to both the audience and the producer. The audience gets the information they want delivered straight to their in-boxes, often tailored to their specific interests. The publisher gets something valuable as well. While interacting with people who clearly like your media outlet and the content you produce, you also get to own the information about your readers, says digital strategist, Jacqueline Boltik. “For newsletter producers, having an email newsletter is smart because it’s the only way to really own your audience online. Ultimately Facebook owns your Facebook fans, Twitter owns your Twitter followers. Building your digital base anywhere other than email is like building a house on rented land,” she said. She says beyond owning your audience data, there are many other reasons to offer a newsletter. These include driving traffic, monetization, and the ability to leverage your email data to strengthen your digital strategy on other channels. While the data certainly has value, a newsletter is much more than simply a data collection exercise. It’s also about building a strong connection between your audience and your publication, and in some cases to your journalists or other content creators. “The best newsletters feel personal. Even though email is one to many, it feels one to one. In general, the more you can make your newsletter feel like it’s from a person while still fitting in with your brand, the better your newsletter will be received by readers,” Boltik said. Quartz publishes a newsletter called the Daily Brief that it sees as a key way to interact directly with some of its most avid readers. “For audience engagement, it’s immensely valuable. Daily Brief subscribers are among Quartz’s most fervent and dedicated readers, and they’re also what advertisers consider to be a “premium” audience. About half are senior leaders at their companies,” Mia Mabanta, Quartz’s executive director of product and brand marketing explained. You would think that driving traffic back to the site would be another primary goal, but publications don’t necessarily see it that way. Email newsletters build and maintain brand loyalty with core audiences—which is valuable in the long term. If they drive traffic, that’s a bonus, but it’s often not the objective. In fact, Quartz includes links to other sites besides their own says Mabanta. “We explicitly don’t use the email as a way to drive traffic back to our site. It’s meant to be a self-contained experience. The user can click through if she wants to dive deeper, but she doesn’t have to. And oftentimes that link doesn’t lead her to QZ.com,” Mabanta said. Vox’s Golis feels the same way. “We don’t approach newsletters as traffic drivers. Instead, they are distributed media experiences valuable in and of themselves. We love them because they give our loyal audiences a way to establish a permanent relationship with Vox. They also give our journalists the opportunity to build that connection and a set of stories and insights with a consistent community over time,” he said. That engaged core audience also draws in sponsors and advertisers, who are willing to pay a premium to get the attention of a known quantity, and because you own your email data, you should have a good sense of who that audience is. “Better leveraging email data is a significant opportunity for many companies and as combining data sources becomes more flexible, digital advertising is going to become much more efficient and effective,” Boltik explained. You can get those sponsors or premium advertisers on board to directly monetize your newsletters. Or you can simply use them as a way to stay connected with your most ardent readers. Whatever the strategy, newsletters remain a valuable way to understand and interact directly with your core audience. And that, in the era of distributed content, is a valuable connection indeed.